Master Ding Academy Traditional Yang Style Tai Chi Chuan. MDA Devon was founded by Brian McDonald, a qualified Instructor with the Master Ding Academy of Tai Chi Chuan. Brian has 50 years experience in the martial arts and has trained in Tai Chi for the last 20 years. Before moving to Devon, Brian was the founder (in 2005) and Instructor of the master Ding Academy's Branch School in Kildare, Ireland. Our Tai Chi is characterised by a strong emphasis on building health, power and understanding of internal energy through experiential study of Tai Chi's concepts and principles. We look at all aspects of the art, so depending on your inclination you could study it as a health art, a spiritual aid or use it to become a highly skilled traditional martial artist. As you might expect from Master Ding being the 1st disciple of Grandmaster Ip Tai Tak, we also look at the methods of energy building, conditioning, power training and defence passed down from him and his influence on what Master Ding teaches can be felt throughout everything we do. The results are a system that we hope teaches you strength and calmness in the face of all life's aspects, lightened by a true joy for living. Our classes are designed to be Informative, Relaxed and Fun. We always welcome beginners and do not expect any special levels of health or fitness. 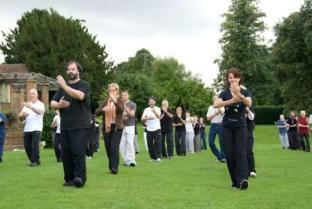 We teach all aspects of Yang Style Tai Chi Chuan: Health, Strength, Confidence and Self Defence. So whether your interest is good health, energy development or martial arts, Master Ding Academy Devon is here for you.